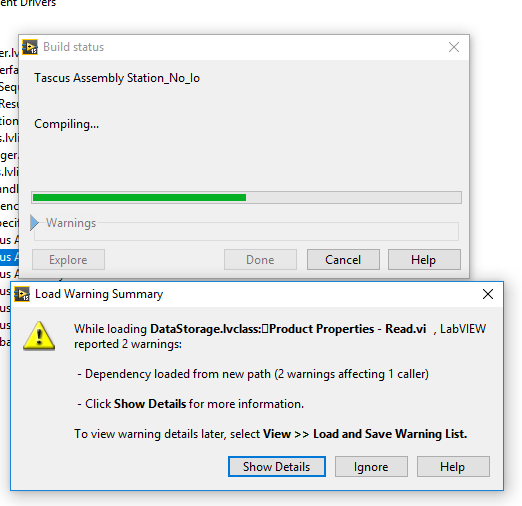 Today I started getting a Load Warning Summary when running my .exe build specification - no idea why, and it is causing the generated .exe to be broken. 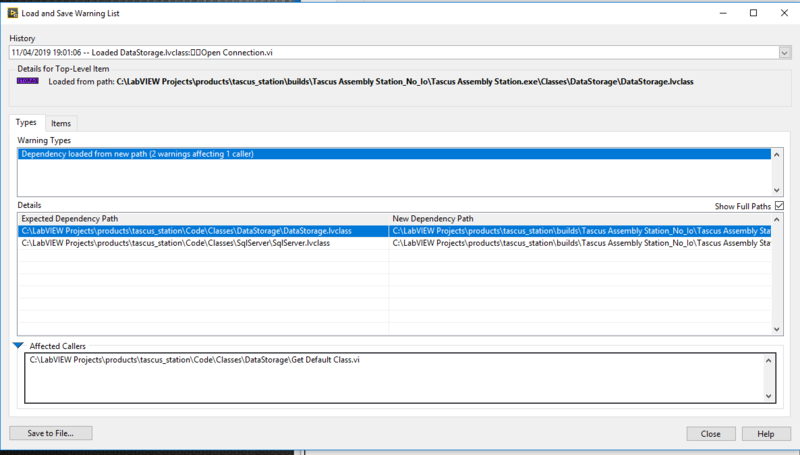 I think it's basically saying in the Load and Save Warning List message box attached that LabVIEW is loading DataStorage.lvclass from within the .exe, when it was expecting it to be within the source code. All I've done today is add some functions to the class, but nothing major. I've tried multiple things to fix it, including a Mass Compile but to no avail. My next step is to revert back a couple of versions to find a version that will build so I can track down what I did to break it. The other thing to say is that this error message appears when about 50% of the way through running the build (during Compile), so it's like when LabVIEW tries to load the class from the vi during the build it's loading it from the .exe rather than source code !? Any ideas would be appreciated if you've seen a problem like this before. Fixed the issue, but that was frustrating! Fixed it by removing the offending vi 'Get Default Class.vi' from the class & project, then re-adding it. Builds fine now, no idea why! That is odd. I've been getting the same warnings for a long time now but my EXEs are build just fine and work as expected after hitting Ignore a few times. Check the project XML and see if there are any absolute paths rather than relative paths.